Theresa May’s promise to build “a new generation of council houses” during her speech to the Tory conference on Wednesday sounded better than it is. May’s pledge of an extra £2bn a year for councils and housing associations to get building barely scratches the surface of a housing crisis of her own party’s making. Each year the number of new homes built falls 60,000 short of the 250,000 required to house our growing population, but the government has already admitted the cash will only fund the construction of 5,000 new homes. Since 2000, the number of homes built for social rents has dropped from 39,560 a year to just 6,800. The amount of affordable homes, which can have rents of up to 80 per cent of the market price, being built has halved to 32,630. Councils now build just 1 percent of new homes. Downing Street said the share of the £2bn the Prime Minister announced equates to around £80,000 per home, a figure housing associations said was only needed for building in the most expensive areas. This means that while the subsidy will most likely help a percentage of those living in areas where rents are much higher, the majority of people who can’t afford to buy a home will still be left at the mercy of an unrestricted market that only benefits landlords. “Of course money to build more affordable housing is welcome, but the sum announced… is a long way short of what is urgently needed to address the crisis,” said Unite general secretary Len McCluskey. Rents are now so unaffordable that currently 77,240 families with 120,540 children are homeless and being put up in temporary accommodation, according to figures from local authorities. The net cost of providing short-term shelter has tripled over the past three years, councils say. 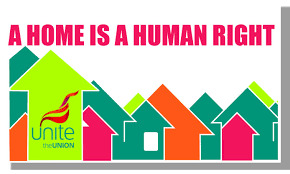 Unite assistant general secretary Steve Turner said the system needs to be rebalanced through investment in large scale council house building programmes to create homes and decent work, as well as by introducing rent controls and regulations on private landlords. He said, “We must embark on massive council home building programme — we need at least 250,000 homes built each and every year to keep up with demand. Find out more about Unite’s strategy for solving the housing crisis here.